CWDM is an optical technology for transmitting up to 16 channels, each in a separate wavelength or color, over the same fiber strand. The CWDM solution help enable enterprise and service provides to increase the bandwidth of an existing Gigabit Ethernet optical infrastructure without adding new fiber strands. Unlike DWDM, which can transmit up to 160 channels on the same fiber by tightly packing them, CWDM technology relies on wider spacing between channels. This design makes CWDM a relatively inexpensive technology for transmitting multiple gigabit-per-second signals on a single fiber strand as compared with DWDM because it can support less-sophisticated, and therefore cheaper, transceiver design. In the point-to-point configuration , two endpoints are directly connected through a fiber link. The ITU has standardized a 20-nm channel-spacing grid for use with CWDM, using the wavelengths between 1310nm and 1610 nm. Most Cisco CWDM system support eight channels in the 1470-to 1610-nm range, shorthand for CWDM-SFP-1470 or CWDM-SFP-1550 or other wavelengths. The Cisco CWDM Gigabit Interface Converter(GBIC)/small form-factor pluggable （SFP）solution allow organization to add or drop as many as eight channels (Gigabit Ethernet or Fiber Channel) into a pair of single-mode (SM) fiber strads. As a result, the need for additional fiber is minimized. You can create redundant point-to-point links by adding or dropping redundant channels into a second pair of SM fiber strands. CWDM multiplexing is achieved through special passive (nonpowered) glass devices known as filters. The filter act as prisms, directing lights from many incoming and outgoing fibers (client ports) to a common transmit and receive trunk port. Optical multiplexing in a ring with CWDM network is supported with optical add/drop multiplexers (OADM). OADMs can drop off one or more CWDM wavelengths at a specific location and replace that signal with one or more different outbound signals. The Cisco CWDM GBIC/SFP solution has two main components: a set of eight different pluggable transceivers (Cisco CWDM GBICs and Cisco CWDM SFPs), and a set of different Cisco CWDM passive multiplexers are compliant with the CWDM grid defined in the ITU-T G.694.2 standards. CWDM can be used by enterprise on leased dark fiber to increase capacity (for example), from 1 Gbps to 8Gbps or 16Gbps) over metro-area distances. 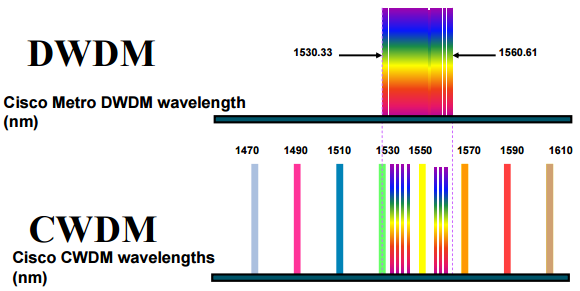 One problem with CWDM is that the wavelengths are not compatible with erbium-doped fiber amplifier (EDFA) technology, which amplifies all signals within their frequency range. EDFA technology is beginning to make repeaters obsolete. EDFA is a form of fiber optical amplification that transmits a light signal through a section of erbium-doped fiber and amplifiers the signal with a laser pump diode. EDFA is used in transmitter booster amplifiers, inline repeating, and in receiver preamplifiers. CWDM supports up to a 30-dB power budget on an SM fiber. This restricts the distances over which CWDM may be used. CWDM may be used. CWDM supports distances of approximately 60 miles (100 km) in a point-to-point topology and about 25 miles (40 km) in a ring topology. In some areas, service providers use CWDM to provide lambda or wavelength service. A lambda service is where a provider manage equipment and multiplexes customer traffic onto one or more wavelengths for a high-speed connection, typically between two or more points. This entry was posted in CWDM Systems, WDM Optical Network and tagged CWDM wavelengths, CWDM-SFP-1470, CWDM-SFP-1550 on April 30, 2014 by Admin.